Add the perfect wording to announce your new baby's arrival to loved ones. Personalise your card by adding your favourite newborn baby photo. Get more than you were expecting, with our innovative digital printing techniques. Announce the arrival of your new baby daughter with cards, create bespoke announcements from our adorable collection of designs. From Teddy bears to rocking horses! We are sure to have a card design that's perfect to notify the world of your fantastic new arrival. "The arrival of our newborn baby was very overwhelming, so it was great to create baby arrival cards online in such an easy fashion and all for a fantastic price. We didn't even have to buy separate envelopes." "After finding a discount code on Facebook we decided to give your site a go. There was a lovely range of designs to pick from and it took no more than 5 mins to add our little one's details. Fab stuff!" "It was so easy to upload our new baby photo to one of your announcement card designs and your prices are very competitive! 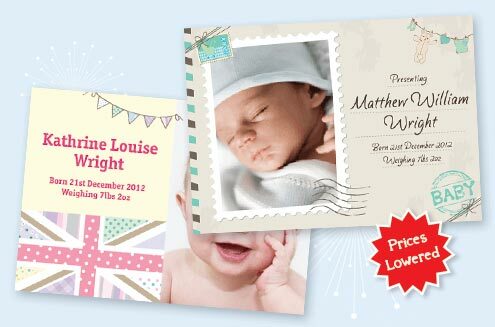 A great website for personalised baby cards." "There was a fantastic selection of baby thank you card designs and the online editor was so simple to use. We will be recommending your site to other new mums and dads." Cards Made Easy (Babyannouncementcards.co.uk) scored 96 out of 100 based on 55 reviews by our customers. Copyright © 2000-2015 Print Evolved Ltd t/a Cards Made Easy (UK) and its licensors. All rights reserved. Registered Office: Units 45-50, 10 Hornsey Street, London, N7 8EL, United Kingdom. Registered in England and Wales. Co. No. 03483147.